Located in the Romanian Carpathians, Transylvania’s premier ski resort boasts pistes that descend from altitudes of more than 5,577 feet (1,700 meters). Officially a suburb of Brașov, the resort town is home to a range of luxury hotels and restaurants, and serves as a convenient launchpad for exploring the Carpathian mountain range. The easily-accessible resort is the ideal destination for a short getaway; some day trips include convenient round-trip transfers and a 24-hour ski pass. Spend the day exploring the slopes; take advantage of private classes to hone your ski skills; or try your hand at paragliding, horseback riding, mountain biking, or cross-country skiing in the scenic surroundings. Multi-day excursions often include the resort as part of a wider itinerary that offers an overview of Transylvania’s natural highlights. Poiana Brașov is an affordable alternative to other European skiing destinations. The slopes are best suited to beginner and intermediate skiers and snowboarders, though the three black runs offer some thrilling moments for experts. It’s possible to rent skiing gear in the main town. The range of runs and activities available make Poiana Brașov ideal for a family getaway. The ski season runs from December to April. Booking accommodation ahead of time is a must as the resort gets busy. Off-season visitors can still enjoy a trip to the resort town; fewer crowds and cheaper prices are a distinct advantage. Lights on the lower slopes allow for skiing well into the evening. Poiana Brașov is a short bus ride away from Brașov, which is directly connected to Bucharest by train. From the main station, you can catch bus number 100, while bus number 20 connects the resort town and the city center. Transport up the mountain includes two aerial tramways, two chairlfits, five ski lifts, one gondola, and a magic carpet. Romania is making a name for itself amongst winter sports enthusiasts, offering affordable and equally scenic alternatives to the famous Alpine slopes. Advanced skiers may enjoy Rânca’s more challenging routes over in the Gorj County, while off-pisters can explore vast expanses of untouched snow in the Bâlea Lake region. Skiing can be a great alternative to sightseeing, regardless of your level of expertise. This ski lesson includes a day ski day-pass and a private ski instructor for you and your group. 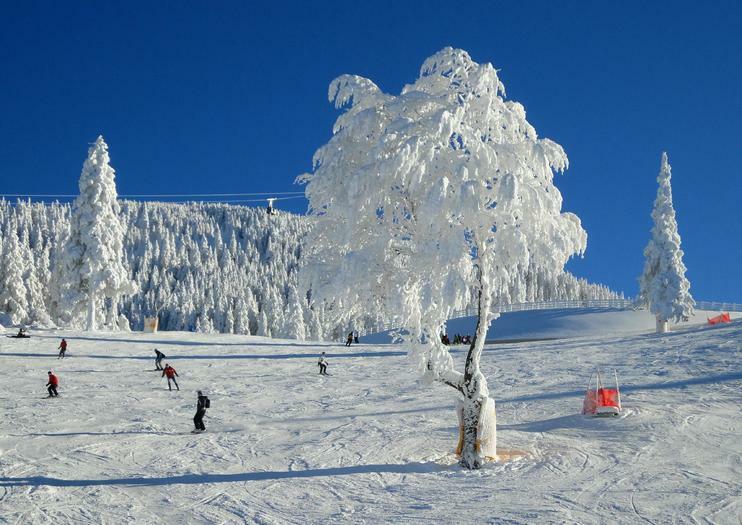 It’s also an easy introduction to Poiana Brasov, with its winter sports arena and 12 miles (20 kilometers) of ski trails. Skip the hassle of car hire whilst still ticking off more of Transylvania’s castles in less time on a hassle-free day trip from Brasov. An ideal choice for visitors interested in Romania’s ancient history, this tour transports you between Bran Castle (Dracula’s Castle), the White Tower (Turnul Alb), and Poiana Brasov with ease, and offers an insider’s perspective into the history and culture of Transylvania. Plus, convenient hotel pickup and drop-off are included. The area of Brasov is by far one of the main destinations for tourists who choose to visit Romania. Thanks to its proximity to the Carpathian Mountains, this region is rich in wild forests, hiking and biking trails and routes, forest roads and natural attractions, as well as historical ones, including UNESCO World Heritage sites. And most important, Romania has the biggest population of brown bears in Europe, making it one of the most important destinations for bear watching enthusiasts from the world.Discover Brasov and its surroundings in this 10 day cycling tour that will make you fall in love with this area.You will travel by bike, go hiking, wine tasting and bear watching.